As I push open the wooden barn door, the dank smell of wet wood and mouldy tile reach for my smell receptors. An involuntary grimace twists through my eyebrows and plump cheeks. When my eyes come into focus on the darkened room, I see other campers giggling and dressing out in the open. My heart squeezes up into my throat. The showers are curtained, but we have to dress out in the open, locker room style. For as long as I can remember, I hated my body. It betrayed me at so many turns. At nine years old I began covering my hurting heart with food. But I couldn’t keep my secret hidden. My body tattled on me with increased abdominal girth and stretch marks ripping across my abdomen, lower back and the inner parts of my upper arms. Avoiding eye contact, I hustle to get dressed. Sopping wet hair clings to my back like octopus tentacles and trails of moisture tread down my body. My clothes bunch up as I struggle and tug them over my thick sticky upper body. “What are those red lines on your arms?” the girl next to me asks. My mouth dries instantly like a crumpled paper napkin, and I have to force a swallow before the words will come out. The tiny trenches display bright red and shame pummels my young heart like rough waves in the ocean surf. For a few years I wore baggy clothes cloaking the bulges and lines hiding underneath. I hated how people noticed my body. I wanted to be so much more than a large body habitus with an unknown heart. Right before high school I learned about the low-fat diet craze. When I coupled controlled eating with running and basketball drills, the weight plummeted and the stretch marks faded. I muted my bodies cravings, ignored her pain, and disconnected from listening to my body. My body was a tool I needed to forge into something tolerable. Maybe one day I would love and accept her. But she had a long way to go. Nothing was perfect about her and I needed to remain extremely disciplined to get her to look the way I want. I would never let her appearance devalue me any longer. There was enough to hate about me. My body was one thing I could control. For decades I let hate for her motivate my eating plans and exercise regimens. Hate for my body fluctuated with my weight my entire life. Recently I came to terms with some abuse in my past. I realised my innocent body was trying to protect me all those years, not betray me. My body had a story. In my healing journey, I started telling the story my body remembered. I gave my body a voice again. Part of my healing process included exercise. This time I wasn’t placing tension on my body to torture her into something more lovable. I approached exercise from a place of love. I wanted to love her like God does and partner with Him in seeing her whole. I wanted to feel my muscles contract and relax. I wanted to enjoy the stretch and sense the release. My breath flooded my cells with energy. I yielded to my limitations and pushed when I felt my muscles enjoy the challenge. My body became me again. Without any dramatic changes in my appearance I began loving what I saw in the mirror, stretch marks, bulges and all. The body looking back at me in the mirror was me and I accepted myself again. Not for my potential or for my hard work, but because I am completely lovable at any size. 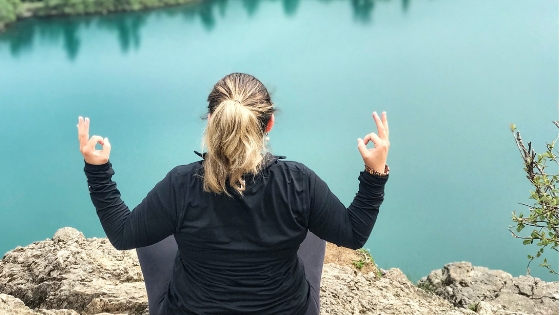 Along with weightlifting, yoga became the perfect practice to reconnect to my disassociated body. Yoga teaches respect for the temple of the Holy Ghost. Our bodies are not trash heaps to trample upon or ignore. Your body is the chosen dwelling place of Heaven on earth. WHAT STORY IS YOUR BODY TRYING TO TELL YOU? LET YOGA HELP YOU RE-INHABIT AND RECONNECT TO THE VOICE OF YOUR BODY. GIVE YOURSELF, AND YOUR BODY, WHICH IS GOD’S CHOSEN TEMPLE, THE RESPECT YOU DESERVE. LEARN TO LOVE YOUR BEAUTIFUL BODY AGAIN THROUGH THE GENTLE PRACTICE OF YOGA.